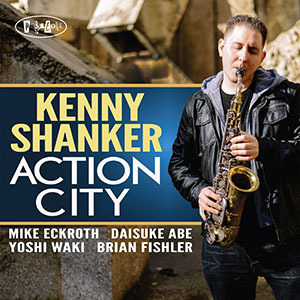 Saxophonist Kenny Shanker swings out onto the town and unleashes a big sound on "Action City," his second release for Posi-Tone. Joining Shanker on the date is his regular rhythm section of pianist Mike Eckroth, bassist Yoshi Waki, and drummer Brian Fishler. With an exciting program of Shanker's original compositions, the session travels steadily straight ahead and shines with bright moments. Shanker's song writing and performance skills have both noticeably moved up to another level, and this hard-hitting set should certainly encourage jazz enthusiasts to take a trip to visit "Action City" with amazement and delight.